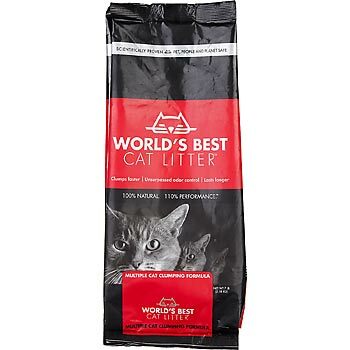 World's Best Cat Litter Multiple Cat Clumping Formula contains an added all-natural plant derivative for enhanced odor control which makes it ideal for homes with two or more cats. World's Best Cat Litter is the only litter made from whole-kernel corn. That means it has a naturally microporous structure that keeps nasty odors and smells inside the litter. World's Best Cat Litter traps the liquid and limits the wetness from seeping, sinking to the bottom or sticking to the sides of the box. With its patented formula and quick-clumping abilities, World's Best Cat Litter is easy to scoop. Cleanup is a breeze! Quick clumping keeps the rest of the litter dry. As a result, one 7 pound bag of World's Best Cat Litter may last one cat more than 30 days. That saves you time and money! Because World's Best Cat Litter is made from all-natural ingredients with no added chemicals it's safe for cats. And unlike clay litters, there's no silica dust for you or your cat to breathe. World's Best Cat Litter isn't made from mined, drilled, or artificially made ingredients. 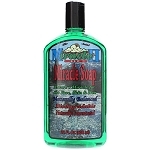 It's milled from renewable whole-kernel corn and is biodegradable. And because it disperses in water, it's also septic-safe and flushable! This litter is the BEST!! I have 5 cats so lots of pee and poop in this house. The litter clumps great but weighs about 1/10 of traditional litter waste. The fact that it is dustless may be why my babies are all sneezing alot less too. VERY HAPPY MOMMY!!!! !